This series of drawings shows the transformation that the rider must go through to acquire an independent position, which is capable of balancing and harmonising with the horse's movement, and also generating the postural leverage which re-balances the horse, initiating the longitudinal stretch and engagement of the horse's postural ring. How we sit on a horse naturally, in terms of pelvic orientation, depends greatly on our own natural physiology, but most riders will tend towards positions one or two in the diagram during the thrusting phase of the hindleg, when the horse's movement exerts a powerful backwards pull on the rider's pelvis. In this position, the seatbones are then left pointing backwards, blocking any forwards transmission in the horse, causing concussive forces in both the horse's and the rider's backs, and a general lack of connection. The second rider position, the so-called 'upright seat' is often proclaimed as the correct seat orientation, however it is passive, neutral way of sitting, which not only lacks a full, adhesive connection, but has no postural influence of the horse's movement, and therefore no re-balancing capacity. Like the fork seat, the upright seat still follows into the disengagement of the horse's pelvis with each hindleg thrust, providing no resistance, and fails to support the carrying phase of the stride when the horse's back naturally lifts. 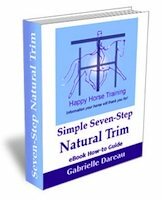 This seat is only appropriate for those riders who are happy to control and 're-balance' the horse with the reins, or who seek to actively block the horse's forward energy with their seat. In order to reverse this situation, the rider must make the radical step of completely changing the orientation of their pelvis, so that the seat comes into the tucked position. The abdominal muscles engage to lift the pubic bone (front of pelvis) into suspension, and the seatbones are now pointing with the direction of the horse's movement. 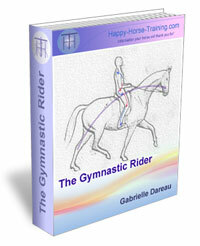 The rider's lumbar back is stretched and supple, absorbing concussive forces. In this transitional phase (middle picture) the rider is in a challenging balance, because the core muscles are not yet strong enough to fully support the tucked pelvis, and the hip joints are usually not supple enough to allow the leg to stay back under the rider. Without full support of the core muscles, the rider must bring the upper body well back in order to help the seat stay in the tucked orientation, and keep the weight dropping into the back of the seatbones. In this phase, the seat MUST be prioritised over the leg position, in order for the postural muscles to strengthen in the right way, and the leg must be allowed to come forwards until the hips become more supple. Once the core muscles have strengthened (4th picture), the rider will be able to start coming more upright in the upper body, and they can equally begin working on the leg position, to start bringing it back, underneath the seat. The thigh stretches back, and the lower leg must learn to aid in a forward direction. The final result is a truly independently balanced but engaged position, where the rider is able to come fully upright (not, however, coming in front of the vertical) without losing any tuck of the seat. This position generates powerful postural leverage over the horse's energy of motion, and is used for collected work (in lengthened work, the rider must take the upper body back to allow the seat to have more horizontal travel in accordance with the movement). The leg is perfected to be vertically positioned under the seat, with a strong rear-thigh muscle, and the calf muscles are stretched to allow the anchoring down of the heel, and sensitive, subtle aiding. The overall alignment of the body in the first picture is not so far removed from that of the last, but a massive, profound change has taken place inside, in the skeletal alignment, which completely changes the way the rider's body interacts with the horse's movement. This is not a change to be taken lightly - it takes years of hard work to achieve. 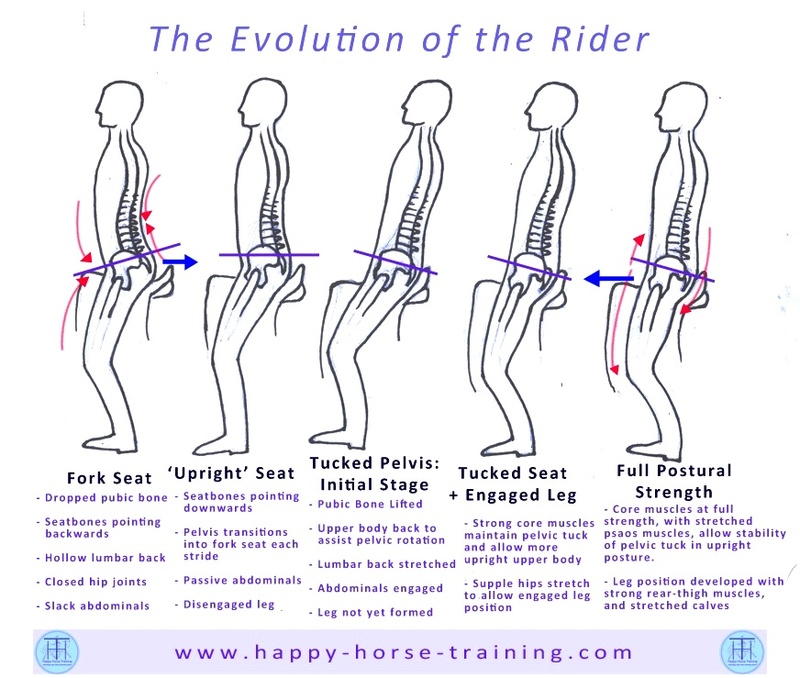 This transformation is rarely undertaken, because almost any riding instructor in the world, past or present, will tell a student that the middle position in the diagram - the crucial transformative stage - is incorrect (it is often described as the 'chair seat'). What is not understood is that this position is the means to an end, as part of a process of gymnastic development. 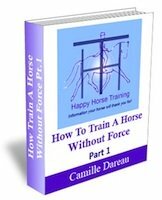 The rider themselves will find it to be a strange and awkward position at first, although they may notice that their seat already adheres much better to the horse's movement, and that the horse responds positively by lifting the back and hollowing less. Despite its initial awkwardness, however, this stage is the ONLY porthole though to the truly balanced, effective position, that is fully connected and interactive with the horse's movement, and does not depend on the holding rein for balance and control.